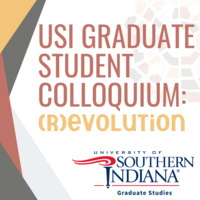 On Monday, April 1, from 10 a.m. until 6 p.m. in Carter Hall, Graduate Studies will be hosting the second annual Graduate Student Colloquium, an event designed to celebrate the work of USI's graduate students. This colloquium will celebrate revolutions and evolutions in art, administration, business, communication, education, history, language, literature, industrial management, medicine, nursing, occupational therapy, policy, politics, science, sport management, society, social work, technology, etc. This event is open to undergraduate and graduate students and the public and will be a great way to learn more about the 15 graduate programs currently offered at the University of Southern Indiana! Faculty are encouraged to bring their classes to the event. Information tables on USI's graduate programs will be set up around Carter Hall.